The acclimation of both the main tanks and the fry tanks is going well. 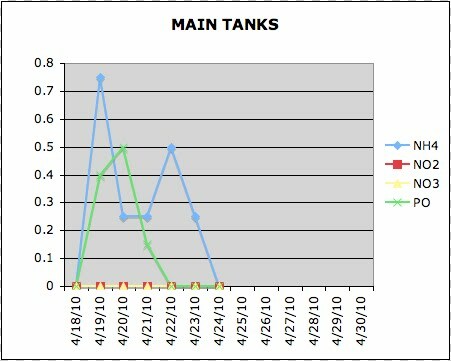 We added approx 5 lbs of fresh chicken manure to the main tanks (in a mesh bag) which brought the ammonia and phosphate levels up from 0 (see chart). After two days everything turned green. The plants, the water, and every surface in the system. Algae can be both a friend and an enemy in a recirculating system like this. The tilapia are adapted to feeding on it, and it removes phosphates and toxic ammonia from the system. It actually produces oxygen when it is growing (during photosynthesis). During the night and on cloudy days, it can consume more oxygen that it produces and if a die-off occurs, it can tie up huge amounts of oxygen and produce toxic ammonia. That could equate to lots of dead fish. We’re going to try to avoid that later by providing supplemental oxygenation to the fish through a blower pump and air stones. I’ve just ordered a dissolved oxygen meter, so we will be able to report on what is really going on in the water. If you know the dissolved O2, the PH, temperature, and total ammonia, you can figure out how much toxic ammonia (unionized) is in the system. Anyways, i have digressed. We were lucky to have been given access to a local pond for plant harvesting. We brought back a generous helping of azolla, also known as red water fern. It forms a dense floating mat, and will supplement the tilapia feed. It pretty much covers the entire bottom trays now. We’ve also got a healthy population of duckweed, water hyacinth, frogbit, salvinia, watercress, and water hawthorn. We’re figuring out the feasability of growing water chestnut, wasabi, ginger, and tumeric as well. We’re expecting the fish in 1-2 weeks and still plan on starting them out in the indoor fry tanks. The water temps in the main tanks (greenhouse) are swinging approx 10 degrees F from day to night. Best temps we’ve seen so far (after 4 straight days of sun) were 67 – 77. Ideal would be ranging from 82 – 92. Lastly, we’re fortunate to have a new partner in this endeavor. Jim and Reta Knott with Aquafarms fish food are providing us with fish chow that doesn’t contain any land animal product. We’ll be starting them out on this feed, as they require more fat as juveniles, then transitioning them over to a mostly vegetarian diet as they get older. That’s all for now. Next post should be all about the arrival of fish. Very exciting. This entry was posted in Uncategorized and tagged Aprovecho Sustainability Institute, Aquaculture, Aquaponics, farm raised fish, tilapia. Bookmark the permalink.